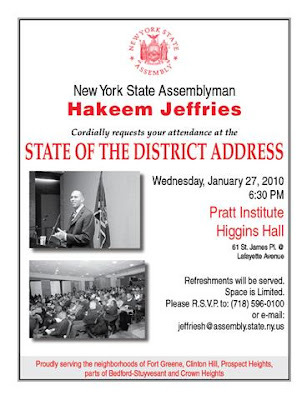 Assemblyman Hakeem Jeffries will hold his annual State of the District address at the Pratt Institute's Higgins Hall at 6:30 pm on Wednesday, January 27. The address is 61 St. James Place at Lafayette Avenue. An RSVP is requested, to either (718)596-0100 or jeffriesh[at]assembly.state.ny.us. This will be the assemblyman’s third State of the District address since taking office in 2007. This year’s speech will mention an update on Project Reclaim, the initiative introduced at last year’s address which seeks to transform market-rate condominiums that have failed into desperately needed affordable housing. The assemblyman will also hold a discussion on the Section 3 Campaign for HUD, and legislative initiatives to combat alleged police misconduct and shootings. In his first and second addresses, he made only glancing mentions of Atlantic Yards, so, according to that pattern, we shouldn't expect much more. Then again, AY is in the news these days.